CINCINNATI (Oct .12, 2018) – ProAmpac, a leader in global flexible packaging, premiers ProActive Sustainability™, a brand mark the company will use to identify products that reinforce its commitment to environmental stewardship and the responsible use of resources. The company will introduce its sustainability mark and display a portfolio of innovative packaging solutions at its PACK EXPO International Booth S-3386, at McCormick Place, Chicago, Oct. 14-17. “ProAmpac is at the forefront of the two biggest trends in packaging? product innovation and sustainability,” said Adam Grose, chief commercial officer. “For ProAmpac, and our industry, sustainability is a journey through complex environmental and social challenges. To maintain a clear focus, we have developed a simple statement everyone at ProAmpac and our partners can relate to, no matter how complex or how technical the situation may be,” said Grose. At ProAmpac, sustainability means being a good neighbor and looking to the future. Using advanced technology, we are developing and innovating sustainable flexible packaging products. By reducing energy use and the environmental impact of our facilities, ProAmpac is also engaging our employees, collaborating with suppliers and customers, and teaming with neighbors to make the communities where we operate, and our packaging, even better. “We call this ProActive Sustainability™, which is incorporated with our products, and internal sustainability programs,” Grose said. Absolute Wrap™ Sandwich Wrap – For commercial food handling, this quilted multi-layer paper-plastic, foil-replacing wrap offers superior heat-retention and non-stick features with grease and moisture barriers. It also preserves product freshness and ensures safe handling. It uses 40 percent less plastic by replacing polyethylene with Calcium Carbonate and can be recycled in paper waste streams. QuadFlex Pouch – This is the industry’s first recyclable polyethylene (PE) based, quad-seal pouch. The quad-seal, flat-bottom format, provides five panels for branding on store shelves and is approved for store drop off through the How2Recycle program. 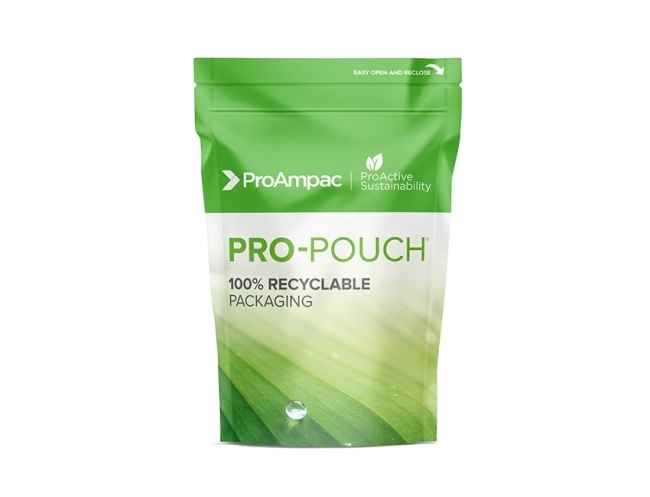 100% Recyclable Pouch – ProAmpac’s first to market recyclable PE pouch (and QuadFlex predecessor) provides several product options including three-side seal, flat, or stand-up with bottom gusset; and also provides stiffness, strength, puncture resistance, moisture barrier, and grease resistance properties. It is also How2Recycle approved. 100% Recyclable High Barrier and Medium Barrier Film – ProAmpac’s recyclable films have been engineered to run on vertical and horizontal form/fill/seal packaging lines for a wide range of applications. These films provide excellent seal, hot tack, clarity, oxygen and moisture barrier and are approved by the How2Recycle program. PRO-VUE Shield– A first from ProAmpac that provides consumers with a clear view of package contents while providing an excellent oxygen barrier along with outstanding sealing properties with PVdC coated films, EVOH sealants, and FDA approved resins. The seal/hot tack properties support high-speed applications. PRO-LocknPeel– This rollstock provides an easily opened, peelable top seal with proven Over the Mountain performance ? preventing packages from bursting in high-altitudes or low atmospheric-pressures. The rollstock is targeted for VFFS quad seal or pillow bag applications and features a gloss or matte, heat-sealable OPP outer web for quad seal food applications. Two and three-ply versions are available. PEEL & RESEAL Lidding— ProAmpac offers film with high oxygen and moisture barrier properties built into the lidding sealant layer, allowing for an innovative way to access the product and a high number of peel and reseal opportunities to a variety of substrates. PRO-TOUCH—A new line of textured varnishes that create shelf differentiation using unique print techniques while capturing consumer attention, building brand equity and engaging customers. Registered matte, soft touch matte and paper touch provide unique finishes and a premium look. ProAmpac is a leading global flexible packaging company with a comprehensive product offering unparalleled in the industry. We provide creative packaging solutions, industry-leading customer service and award-winning innovation to a diverse global marketplace. We are guided in our work by four core values that are the basis for our success: Integrity, Intensity, Innovation, and Involvement. Cincinnati-based ProAmpac is owned by PPC Partners along with management and co-investors. For more information, visit ProAmpac.com. PPC Partners acquires and operates North America-based, middle-market companies with leading positions in the manufactured products, services and healthcare sectors. Led by Tony Pritzker and the former investment and operating professionals of Pritzker Group Private Capital, the firm’s differentiated, long-duration capital base allows for efficient decision-making, broad flexibility with transaction structure and investment horizon, and alignment with all stakeholders. PPC Partners builds businesses for the long-term and is an ideal partner for entrepreneur and family-owned companies. For more information, visit PPCPartners.com.